Dr. Dirk Wisselmann, senior expert for autonomous driving at BMW, tells me that the automaker’s first level 3 car will have the technical capabilities for level 4 or 5 highway driving. “We can create a software update (for the car) and inform our drivers, ‘We are are very confident on this road. We are very sure nothing can happen. You can sleep if you want to.’” He makes sure to note that this is a best-case scenario. We’re sitting in the automaker’s latest research center built specifically for that highly sophisticated car. Or in BMW’s case, two cars. One is the all-electric level 3 iNext that will be sold to the public. On the highway, the car should be able to drive itself under set circumstances. The other is a fleet vehicle with level 4 (and potentially level 5) capabilities that will be part of BMW’s upcoming branded ride-hailing service. The automaker plans on delivering both of these vehicles in 2021. BMW has been erring on the side of caution when it comes to autonomy (I’m reminded of this multiple times while in Munich). Who can blame them with the recent Uber tragedy and Tesla Model S accident? It’s important to remember that cars are not phones or laptops or even electric push scooters. Sure the technology inside automobiles is advancing far quicker than ever, but automakers still have to produce software and hardware solutions that appease regulators and, more importantly, keep drivers safe. When a smartphone freezes up, you just restart it. When a car freezes up at 80 miles an hour on the freeway, it’s suddenly an uncontrollable death machine. 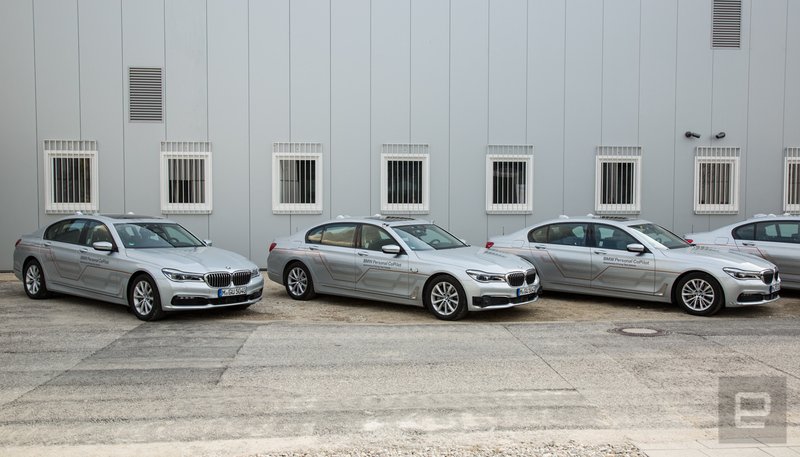 So whatever resources BMW wants to throw at autonomous car research are welcome. But making sure the automaker’s 2021 plans (and beyond) come to fruition means it’s decided to go all in on self-driving research. With that in mind, BMW opened its Autonomous Driving Campus near its headquarters in Munich, Germany, this week. The facility’s 23,000 square meters (5.6 acres) will eventually accommodate 1,800 employees and 500 vehicles. While I attended the grand opening of the campus (that’s still under construction), there are already employees at the site working. During a tour of one of the completed buildings, the automaker showed off how it plans to achieve autonomy in the future and change the way it works. Instead of a single team working on an entire system, sub-tasks (features of a system) are assigned to various departments to tackle problems in a fast-paced environment. BMW compared it to how startups work and touted how agile this will allow them to be. The automaker noted that since deploying its test fleet in California, it has racked up 24 million kilometers (14.9 million miles) in data. But 95 percent of those miles were tested in a proprietary BMW simulator using data from its test cars, Pegasus the open-source scenario database, and a scenario editor. The result is something that looks like a video game where researchers fine-tune edge case situations to see how BMW’s AI reacts to certain events. Other companies like Mercedes, GM and Waymo also use simulators to test and train their AI. It’s become an important part of the research. It’s nearly impossible to encounter every situation while driving test vehicles. It’s completely impossible to recreate and slightly tweak those situations to account for changing weather and road conditions and the presence of more (or fewer) vehicles, pedestrians and other objects. Of course, all the car data has to come from somewhere. During a sensor demonstration, BMW shared a new solid-state LiDAR system that it says has double the range and 2.5 times the resolution of what’s currently on the road today. On its test vehicles, laser-based sensors are placed in the front center and sides and rear. The result should be a higher-quality image of a car’s surrounding area than what we’ve seen in the past. Typically a sensor helps parse the objects it detects and passes it on to the vehicle’s computer. BMW has decided to use the raw data directly from the cameras, LiDAR, radar, etc, combine it and do its own object detection. So instead of three pieces of hardware telling a computer if they see a person, the internal CPU uses the combined raw data to “see” a pedestrian. BMW also believes mapping is part of that data-gathering package. “It’s very important. We see it as a different sensor. With our onboard sensors, we are creating a live map of just what’s happening around the car and we have a live map coming from Here,” Dr. Wisselmann told Engadget. The live information and saved map data are overlaid to make sure the car is where it says it is. Nokia’s Here maps was acquired by BMW, Audi and Daimler in 2015. Mercedes uses it to for Active Distance Assist Distronic on the new S-Class to slow a car down if the map determines an upcoming corner is too sharp for the car’s current speed. BMW’s iNext won’t be the first level 3 car available for purchase. That distinction goes to Audi’s 2019 A8. Unfortunately, there are regulatory issues that determine when and where the technology can be deployed. BMW is hoping by 2021 countries (and states) will have figured out how to accept vehicles like the iNext and A8. Meanwhile, the automaker is determining how to actually navigate the autonomous future. The new Autonomous Driving Campus is not just a solid step in the right direction, it’s a huge leap both financially and in how it builds cars generally. If an automaker isn’t working on this issue, it risks being left behind. BMW wants to make sure it does this right. It wants to be cautious. Seriously, they told me that over and over again. But that’s important. Not just for the automaker but for the entire industry. Being careful about introducing these types of features keeps drivers safe and cars out of headlines. BMW is known for fast cars. But fast doesn’t necessarily mean unsafe and a giant facility dedicated to making sure its first self-driving cars are conservative on the roads is a good thing.